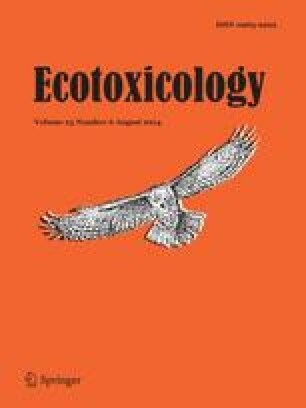 Mercury (Hg) is a widespread contaminant that has been shown to induce a wide range of adverse health effects in birds including reproductive, physiological and neurological impairments. Here we explored the relationship between blood total Hg concentrations ([THg]) and oxidative stress gene induction in the aquatic piscivorous Double-crested Cormorants (Phalacrocorax auritus) using a non-lethal technique, i.e., blood gene expression analysis. P. auritus blood was sampled at five sites across the Great Lakes basin, Ontario, Canada and was analyzed for [THg]. To assess cellular stress, the expression of glutathione peroxidases 1 and 3 (GPX1, GPX3), superoxide dismutase 1 (SOD1), heat-shock protein 70 kd-8 (HSP70-8) and glutathione S-transferase µ3 (GSTM3) were measured in whole blood samples using real-time RT-PCR. Results showed a significantly positive correlation between female blood [THg] and both GPX3 and GSTM3 expression. Different levels of oxidative stress experienced by males and females during the breeding season may be influencing the differential oxidative stress responses to blood [THg] observed in this study. Overall, these results suggest that Hg may lead to oxidative stress as some of the cellular stress-related genes were altered in the blood of female P. auritus and that blood gene expression analysis is a successful approach to assess bird health condition. The authors would like to thank A. Siew and A. Maclean for primer optimization. We also thank J. Cox, S. de Solla, D. Tyerman, B. Hickey and S. Belfry for advice and assistance in the field, as well as S. Wallace and E. Chown for assistance with bird sexing. This study was funded by two Discovery Grants from the Natural Sciences and Engineering Research Council (NSERC) of Canada to VSL and LMC, an NSERC-CGS(D) to RAL and an NSERC-USRA to LAG.